Home > FAQs > I can’t download the demo. Note for Apple Users: It is quite a challenge to download the demo straight to your iPhone or iPad because you would need to get a separate app for this. We recommend that you download first to your computer, then transfer it over to your iPhone/iPad/iPod. If you don’t have a computer, you can stream it directly through SoundCloud. The SoundCloud links are found on the download page. A popup will appear and you will be asked to save the file iAwakeExplore3.zip to your preferred folder. Please remember which folder you have chosen to save it to. 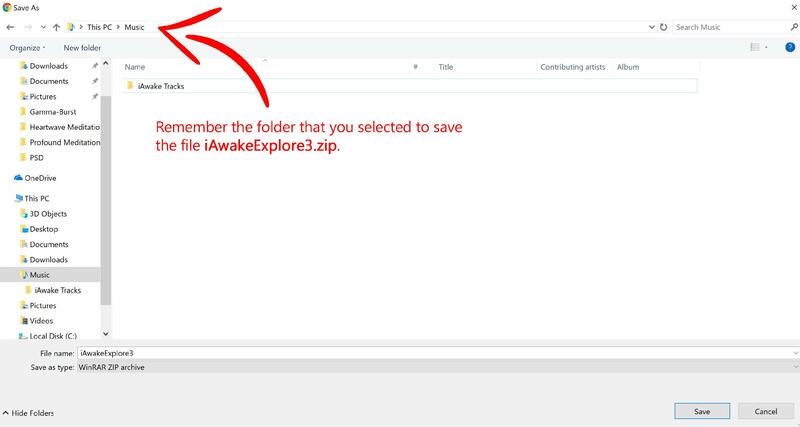 Once the download has finished, just double-click your iAwakeExplore3.zip file to extract the contents, follow the instructional prompts from your computer, then play your audio files. If you are still not successful, please email us: [email protected]. How do I download straight to my iPhone/iPad? How do I download straight to my Android device? What kind of headphones should I use to listen to the iAwake audio files? Can you recommend some optimal headphones to use with iAwake products? Does it matter whether I match ears to headphones? What audio players can I use to listen to the PMP audio files? Can I download the tracks to multiple devices? Which audio file format is best? When I import the tracks from the CDs, they don’t keep their labeling information—what should I do? How do I transfer my downloaded files to iTunes? How do I change my Gmail settings to have iAwake emails go to the Primary inbox tab? How do I transfer files from iTunes to iPad/iPod/iPhone?